I’m sitting on my terrace with open views of Manhattan looking south. No matter how many times I see the skyline the absence of the World Trade Center Towers is unreal. 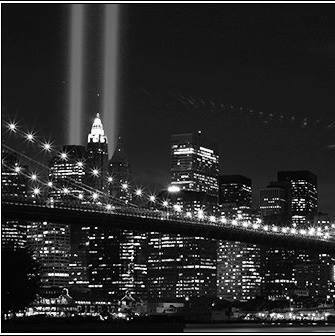 Tonight, as every year since 2001, there are two beams of light rising up from Ground Zero to honor those lost and those who tried to help. Six years ago today I work up at 5 AM and boarded a 7 AM flight for San Diego, via Salt Lake City, to attend a wireless conference. At 9 AM I dialed in to a conference call from my seat on the plane. The system said the call had ended. Strange, but stuff happens. Within minutes the announcement came that we were landing. There was, we were told, an air traffic situation and all planes in the area were being asked to set down. I got a call through to home and was getting the blow by blow on what was really happening. At the same time the gate personnel were making an announcement. The girl next to me was on the phone sobbing. Then she collapsed into the arms of a fellow passenger. Confusion. Madness. We finally convinced them to open the bar. It was 9 AM in Omaha. The bar was silent. Not a sound. Five hours of total strangers transfixed by television. I sat at the bar between a young girl en route home to Phoenix and a Pentagon employee. I can’t remember their faces. All I can remember was what everyone else remembers. The dust from the collapse of the first tower. The second tower crumbling. The smoke pouring out of the Pentagon building. Eventually I made my way to a Red Lion Inn. At that point I think we all believed the planes would be flying within a day or so. The magnitude of what had happened still hadn’t sunk in. When I woke up Wednesday morning, desperate to go home, I was determined to make my way east one way or the other. Nine hours alone in a rental car to Chicago talking to friends and co-workers stranded all across the country. On the outskirts of the city I met up with my boss and two colleagues for the drive to New York. I was never so happy to see people in my life. I’d been holding it in since the day before and when I saw them my knees went weak. Another 22 hours driving to New York. These were the longest couple of days of my life. But they attacked my city and I needed to be with my people. My neighbors. In my city. I felt like I needed to wrap my arms around all of the people who had been there and tell them we would be all right. Different, but we would get through it together. As long as I live I will never forget the moment we got a look at the city that had been forever changed. Coming across the George Washington Bridge and seeing a plume of smoke where the towers stood was like being punched in the stomach. At the same time home was the only place I wanted to be. I think I speak for many when I say that New Yorkers still stand together in grief and solidarity six years later. We are more fragile than before. We are stronger than before. We are united in our love for this city. It’s going to take a hell of a lot more than some crackpot in a turban and the sheep-people who hang on his every word to beat us down! What a well written moving story! You’ve been through quite a trip!